We’ve all forgotten about the oceans! I recently wrote a blog post about Roger Pielke Sr’s guest post on Climate etc. in which he was suggesting an alternative metric to assess global warming. Roger was essentially suggesting that we should be using the ocean heat content (OHC) as a metric for global warming. I largely agree, although I don’t think it should be the only metric. I also – after writing the post – discovered that Roger had made a mistake that somewhat weakened the conclusions that he drew from his analysis. As part of his post, Roger included this quote – attributed to James Lovelock. What is being suggested – I think – is that even though we have an energy imbalance (we’re receiving more energy than we’re losing) the extremely large heat content of the oceans (500 – 1000 times greater than the surface/atmosphere) means that most of this can simply go into the oceans without causing a significant rise in surface temperatures. Often, though, when someone thinks that everyone else has forgotten something, it’s more likely that everyone else hasn’t, but they’ve considered it and realised something that the first person hasn’t considered. Here’s what I think those who argue that the oceans can absorb all the excess energy haven’t considered. Our emissions are largely determining the energy imbalance. The imbalance is removed through a rise in surface temperatures. The slower the surface temperatures rise, the larger the imbalance will become and the more energy will be accrued by the system. Therefore, even if the oceans could absorb a massive fraction of the excess energy [edited to change “Energy Imbalance” to “excess energy” – prompted by Eric Steig’s comment], it may not “help” as much as some might think. Also, we know – from observations – that although the heat capacity of the oceans is 500-1000 times greater than that of the surface/atmosphere, it’s currently not accruing 500-1000 times more energy than the surface/atmosphere. The oceans are absorbing just over 90% of the excess energy, with the surface/atmosphere absorbing a few percent (2% – 4%). It’s more like 50 times more, than 500 times more. However – just for fun – I thought I might consider what would happen if the oceans were absorbing a much larger fraction of the energy excess. A while ago I wrote a simple two-box model – one box representing the surface/atmosphere and the other the oceans. For this particular test, I’ve simplified the model : I’ve assumed that there’s no coupling between the two boxes and have removed the influence of ENSO events. I’ve used the RCP11 dataset for the period between 1880 and 2010, then assumed the anthropogenic forcings increase linearly to a maximum of 8.5 Wm-2 in 2100 and remain constant after 2100. I also assume that feedbacks are 2Wm-2K-1. I’ve run two tests : one in which the surface/atmosphere absorbs 2% of the excess energy, with the oceans absorbing the other 98%. In the second test I assume the surface/atmosphere absorbs 0.2% of the excess, with the oceans absorbing 99.8% of the excess (i.e., the oceans are absorbing 50 times more than the surface/atmosphere in test 1, and 500 times more in test 2). The figure below shows how the surface temperature changes with time, the solid-line being the 2%-98% test, and the dashed-line being the 0.2%-99.8% test. In the 2% test, the temperature anomaly in 2010 is about 0.8oC, very similar to what is actually observed today. In the 0.2% test, it is only 0.2oC, lower than in the other test, but not by as much as you might expect. Also, with time, it starts to catch up, and by 2100 it is 2oC, only about 2 times less than in the 2% test. Also, the temperature continues to rise and would eventually equilibrate at the same temperature as in the other test. So, if the oceans were absorbing a much larger fraction of the energy excess, the surface temperature would rise more slowly, but not as slowly as one might think, and the difference would reduce with time. Why is this? It’s essentially illustrated in the figure below, which shows the change in the energy imbalance (Wm-2) with time. In the 2% test, it rises to around 1Wm-2 and remains at this level till 2100 (when the radiative forcing reaches it’s maximum value of 8.5Wm-2) and then drops as the temperature rises to equilibrium. In the 0.2% test, however, it continues rising (because the surface temperature is forced to rise slowly) to over 5Wm-2. This may be one of the strongest illustrations of why James Lovelock’s suggestion doesn’t make sense – with a 5Wm-2 energy excess, it seems completely implausible that the oceans could continue to accrue virtually all of the energy excess. One final consequence of what James Lovelock is suggesting is what would happen to the ocean heat content. This is shown in the figure below. In the 2% test, it would rise by about 1024J before the system equilibrates. Also between 2000 and 2010, it rises by a little less than 1023J, again very similar to what’s actually been observed. In the 0.2% test, it rises by more than 1025J before equilibrating – more than 10 times more than in the 2% test. So, to be clear, what’s being suggested in James Lovelock’s quote at the beginning of this post doesn’t really makes sense, and you don’t really need to run a model to illustrate this : but I quite like seeing it demonstrated. Essentially, as expected, we can roughly match what’s been observed if the oceans absorb about 50 times more of the excess energy than the surface/atmosphere. If, however, the oceans were absorbing a much bigger fraction of the energy excess, the surface temperatures would rise more slowly, but not by as much as you might expect and it would produce an implausibly large energy excess and significantly increase the amount of energy going into the oceans. Not only would this require that this energy is rapidly transported into the oceans depths (in order to prevent the surface warming from accelerating), but 30% of the surface of the planet is land, so it seems unlikely that such slow surface warming could be sustained. Anyway, there’s probably more that could be said, but I think this post has already become rather long and convoluted. I do hope that it makes some kind of sense, though. If you have any thoughts, feel free to make them through the comments. This entry was posted in Climate change, ENSO, Global warming, Science and tagged Climate etc., energy excess, Energy imbalance, Global warming, James Lovelock, Judith Curry, Ocean heat content, Oceans, Roger Pielke Sr, surface temperature. Bookmark the permalink. 18 Responses to We’ve all forgotten about the oceans! Coming from another direction, approximately 50% of the sea level rise is due to thermal expansion . That is about 1.6 mm/year. How much energy do you need to get this much expansion? 10^23J/decade! It gives confidence in the science when two independent approaches to a problem give the same answer..
And that makes it nice to also plot the sea level rise in case only 0.2% of the energy goes into the surface temperature and the oceans would absorb a lot more energy. Or just to give the last plot an additional y-axis. Well, your numbers are off by quite a bit. 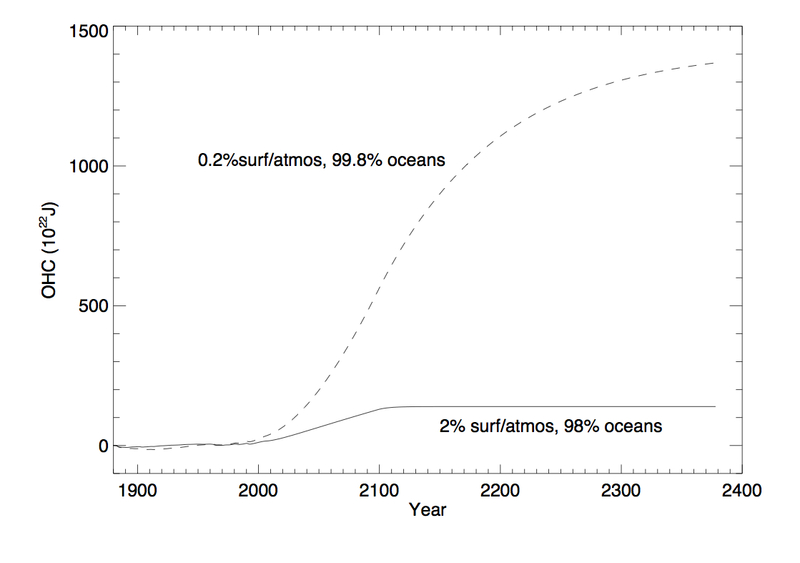 and the 0-2000 metre ocean is warming at 0.5 W/m2/yr or 4.0 10^22 joules per year or 0.002C per year or 0.22C in 100 years. Those actual recorded measurements would barely show up in the scale of your graphs. Let’s be clear here! You wrote, “…even if the oceans could absorb a massive fraction of the energy imbalance, it may not “help” as much as some might think.” Well, yes, sort of. But the ocean does not “absorb energy imbalance”. It is reasonably to say that it “absorbs heat”. The only way to balance the energy imbalance at the surface is to increase the outgoing radiation to balance the incoming radiation. The the earth does this by warming up. As your graphs illustrate, the ocean can change the rate, but they can’t change the end game. What you say at the end is completely correct (I think I essentially said that too). The end result has to be the same, and all the oceans could do is change how long it takes to get there. Something I was trying to illustrate is that even an order of magnitude change in how much of the excess energy (heat) is being absorbed by the oceans doesn’t change the timescale by an order of magnitude. It has a much smaller effect than one might naively think. Indeed, that’s partly how my two-box model worked originally. I don’t think my numbers are off. Yes, that would be interesting and is related – I guess – to what Entropicman was also suggesting. Thermal expansion coefficient of seawater varies from essentially zero at freezing point and low pressure to 0.00033 1/K for warmest surface waters. The effective average in warming of oceans depends on which parts of the ocean warm most. The range of values 0.0002 – 0.00025 1/K could be taken as representative. 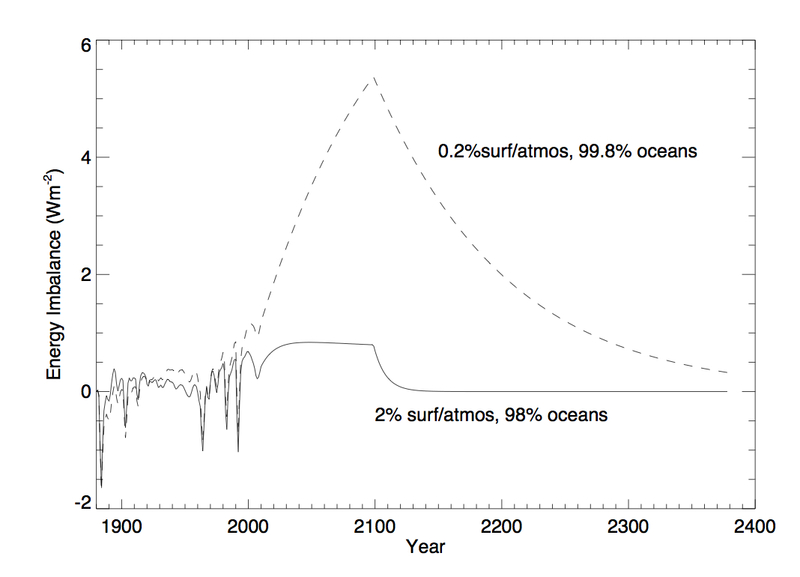 Based on that range the sea level rise is 1.3 – 1.6 mm for added 10^22 J of heat in oceans. (The estimate is based on numbers on my own Excel sheet, thus an error is possible). I add a link to the dependence of thermal expansion coefficient on temperature, pressure and salinity. Those numbers form the basis for my estimated range. The expansion seems to be typically less at depths of 500-3000 m than near surface or in deepest ocean, when typical temperatures are taken into account. If most of heat ends up at those depths, then the sea level rise is slower. Hi ATTP – This is an interesting exercise. In a practical sense, I see it as more relevant to TCR than ECS. If you fix forcing (Wm-2 imbalance) and feedback (extent to which imbalance is reduced per K warming), then ECS is fixed in a simple energy balance model (in the real world, feedback probably declines with time and/or warming). However, in contrast to the equilibrium value, the rate of warming is highly dependent on the efficiency with which the ocean takes up heat. With higher efficiency, as in the case of your two-box model, the surface warms more slowly and the TCR/ECS ratio would decline. A median value from models is about 0.56 – transient vs equilibrium responses. Regarding heat storage in the climate system, I’m not familiar with the exact quantification, but I assume energy is stored in the ocean, land, atmosphere, latent heat (ice melting and water vaporization), and in kinetic energy involving the air and water, and that this is what leads to the 90% figure for the oceans alone. Thanks, that’s an excellent point. As you say, given the assumptions, the equilibrium temperature is unaffected by the ocean heat uptake efficiency and so this is more relevant to the TCR/ECS ratio. In my simple model the 2% run has a temperature of 2o when the forcing is 3.7 Wm-2, while the 0.2% run has a temperature of around 0.6oC. So, quite a massive difference, but probably also illustrating how unrealistic the latter assumption is. As for the heat storage in the system, you’re right that there is more than just the oceans, surface and atmosphere. This Skeptical Science post suggests it’s more like 93% into the oceans and around 4-5% into the land and atmosphere, so my numbers were simply approximations. 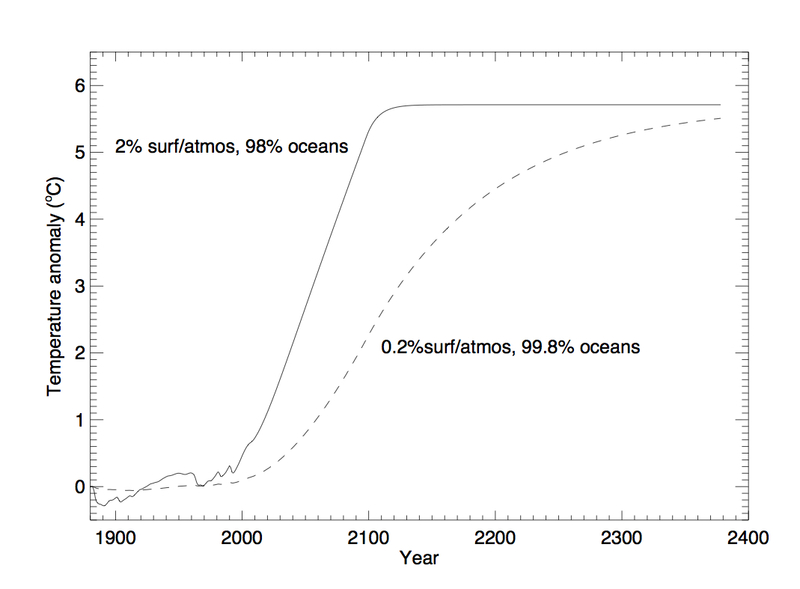 Steig: …the ocean[s] can change the rate, but they can’t change the end game. One thing we can be fairly certain of is that once the oceans have gobbled enough heat to begin participating in restoration of radiation balance, the end game’s going to include some very interesting weather. Spencer’s proffered “get out of jail free” card is quite worthless, dang it. The delays related to ocean warming are long enough to influence the maximal consequences of the CO2 releases. Figure 12.44 of IPCC AR5 WG1 may represent the best guesses on what might be coming. The uncertainties are surely large, my impression is that the ranges shown in that figure are narrower that what one would expect based on other parts of the report. Even the uncertainty in persistence of CO2 in the atmosphere seems to by much larger according to Box 6.1 Figure 1. I may be missing something here, but in order for heat to get into the ocean, the atmosphere needs to warm up (else where does the heat come from? It’s not from increased radiation). So it would seem to be physically not possible to enforce a scenario where heat went into the ocean without first warming the atmosphere. Of course, I suppose there could be an initial rise in atmosphere temps followed by a period in which heat moved into the ocean whilst atm temps stayed relatively constant due to that flux. No, I don’t think you’re missing something. That’s in some sense, the point I’m trying to make. Maybe it’s a little subtler in that if there was some mechanism to rapidly move energy into the deep ocean, you could slow the surface warming. Given that I don’t think there is, that suggests that the oceans won’t “save” us from warming. I’m wondering if you could post a table of your forcing (w/m^2) and response (degrees C) data used with your two box model? I think you had an ENSO adjustment, so that would be useful as well, but not entirely necessary. If you go to the two-box model post (which is linked to in this post) you’ll find a link to Kevin Cowtan’s website where you can run one of his models and then download the forcing data. The ENSO data I got from here. Let me know if you have any problems getting the data. I’ll have a look at yours when I get a chance. Thanks. I used my model to fit KC’s default 2 and 3 box models using GISS forcings over the period 1900-2010. For 2 box, R2=0.998 sd=0.01C. For 3 box, R2=0.996 sd=0.02C. My 2 box TCR was 2.07C vs. 2.00C for KC and my 3 box TCR was 2.62C vs. 2.47C. So it looks like my model can reasonably emulate 2 or 3 box model results.